The Northern Lights (also called Aurora Borealis) is one of Alaska’s most spectacular natural winter displays. Every year more than 250,000 people visit the state between October and April in hopes of catching a glimpse of the colorful light show. The savvy ones will stay at the Fairbanks Princess Lodge which is open year-round. The awe-inspiring Northern Lights are caused by energetically charged atoms colliding into each other about 60 to 70 miles above the earth’s surface. How far up the atoms are in the earth’s atmosphere determines which of the vibrant colors of yellow, green, blue, purple or red viewers are treated to. The most common colors displayed are shimmering yellow and green ribbon-like strands that seem to dance across the night sky. On rare occasions, lucky observers are treated to bold, red-colored lights. Ideal conditions for viewing the Aurora Borealis are on days or nights that have clear moonless skies. The most active times are around the autumn and spring equinoxes in September/October and March/April. Most often the best viewing for the Northern Lights is late at night or in the early morning. 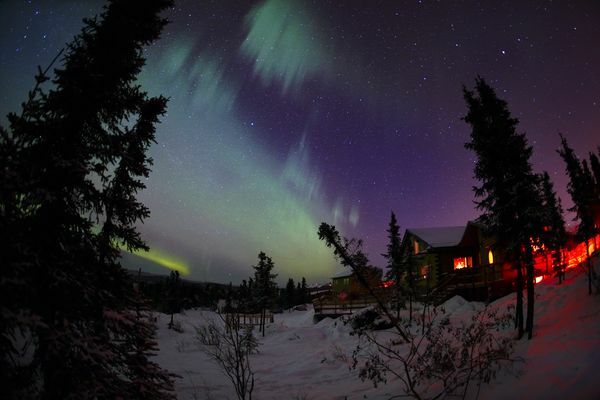 Many Alaska hotels offer a “Northern Lights wake-up call” to alert their guests when the Aurora Borealis is visible. The Aurora Borealis is a truly dazzling display and inspires seasoned Alaskans and those visiting the state. The University of Alaska Fairbanks online forecast website is a great place to check best viewing times for the Northern Lights. View photos of the Northern Lights submitted to the Anchorage Daily News.